Use of smartphones for personal and business has been growing exponentially over the past few years. Business, entertainment, productivity tasks are now increasingly done using smartphones. As the usage of smartphones for conducting daily business activities increases, the storage and transmission of sensetive data increases on these devices as well. Protecting sensitive data therefore has become a priority both at a personal and business level. Knox is Samsung’s guarantee of security. Samsung designed Knox to address data security concerns so that your employees can use their devices with the peace of mind that their information will be securely maintained. 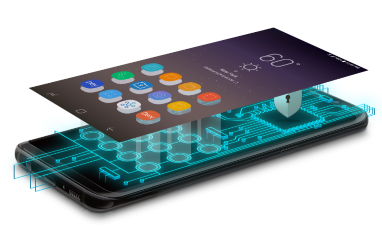 Samsung Knox consists of a highly secure platform built into Samsung devices, and a set of solutions that leverage this platform. IT admins usually have a hard time configuring devices for the enterprise. Knox Configure lets IT admins quickly and remotely configure and deploy devices and tailor them to specific needs with the cloud-based Knox Configure. Samsung KNOX Manage helps in managing and securing your fleet of devices with a cloud-based EMM solution that increases business efficiency and secure corporate data. Knox Manage empowers IT admins to remotely manage devices across multiple operating systems using a cloud-based command centre. Knox Manage can manage devices using the Android, iOS or Windows 10 operating systems. Using KNOX Manage controlling corporate devices is made easy with Knox Mobile Enrollment IT Admins can enable auto-installation of EMM client & enable automatic log in with user credentials In the event of requirement to factory reset the device, automatic re-configuration can be enabled post factory reset. Quick Start Wizard helps customers not using Knox Mobile Enrollment or not familiar with EMM to easily setup initial environment. The wizard can also help in applying policies for camera, GPS, email settings, factory reset, Wi-Fi settings, and push in-house and public store apps directly, and effortlessly, to the devices. Smartphones are powerful portable computers, but with Knox Manage, an enterprise IT team can restrict how these devices are used to prevent leaking of confidential business data by employees through misuse. Knox Manage provides more than 280 policies, including whitelisting and blacklisting apps and websites to help IT teams manage the use of these devices. IT admins can also manage devices based on pre-defined events – for instance, blocking access to cameras on employee phones during work hours, or establishing an exception policy to a specific user for a certain length of time. 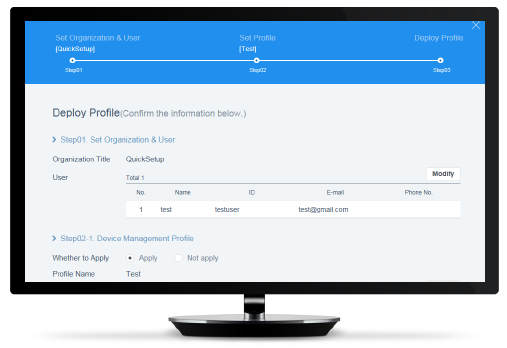 Knox Manage also provides a built-in app launcher on the console and a customized kiosk screen. Hardware buttons usage can also be restricted. Using Remote Device Monitoring features, IT teams can remotely access employees’ mobile devices, with their permission, to identify problems and provide swift response, IT teams can easily monitor device status and fix incorrect settings or install new apps.